Scenes from the National Road in 1920 — I bought some little cards showing scenes from the road in 1920. Then and now on the National Road — Vintage postcard views of the road compared with more recent photos. The National Road in Maryland — A preview of my trip along the road. 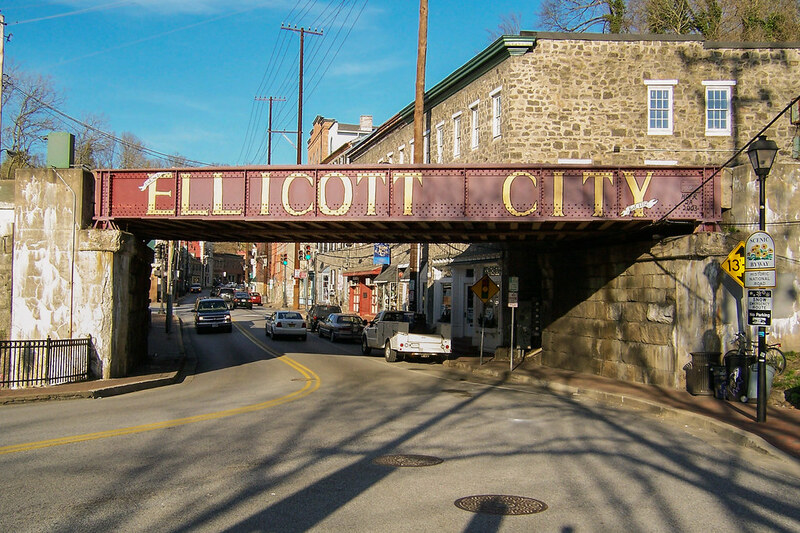 Ellicott City — A very old town along the road. New Market — The antiques capital of Maryland. Antietam Creek bridges — Three bridges on and near the National Road that cross Antietam Creek. The Wilson Bridge — This big stone bridge is named for its builder, but it crosses Conococheague Creek. Abandoned 1930s National Road pavement — Curiously, a short stretch of old pavement was left behind when US 40 was widened and straightened. The view from Polish Mountain — A stunning landscape from the road’s original alignment. Three bridges over the Casselman River — One stone, one steel, and one concrete. This post is brought to you by the letter S — An S bridge. Addison Toll House — After the US government got out of the National Road business, it became a toll road. 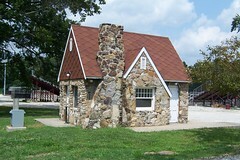 Here’s one of the toll houses. The Wheeling Suspension Bridge — I always swore I’d drive the bridge, and I finally did. And so ended our vacation — I wrecked my car after entering Ohio on the road. Whee. Clinching the National Road — Two years later, I returned to Ohio to try again. I succeeded. Saying goodbye to the old bridge at Bridgeport — When I wrote this, the bridge still stood. Not anymore. Bricks and bridges at Blaine — An 1828 bridge, with its brick deck, preserved alongside a more modern bridge. Then there was the time I-70 jumped out in front of my car — Seriously. I about pooped my pants. The disrupted National Road — I-70 clings to the National Road so closely over these 18 miles that sometimes they’re the same road. They say the old S bridge is crumbling, but it held up my car just fine — An 1828 S bridge that you can still drive on, or at least you could when I wrote this. The last drivable National Road S bridge closed due to heavy trucks — That driveable S bridge? Yeah, it’s closed now. The house on Best Road — On an old alignment high over current US 40 stands a gorgeous 1870s home. Old buildings in Old Washington — A National Road town so well preserved it’s like stepping back in time. 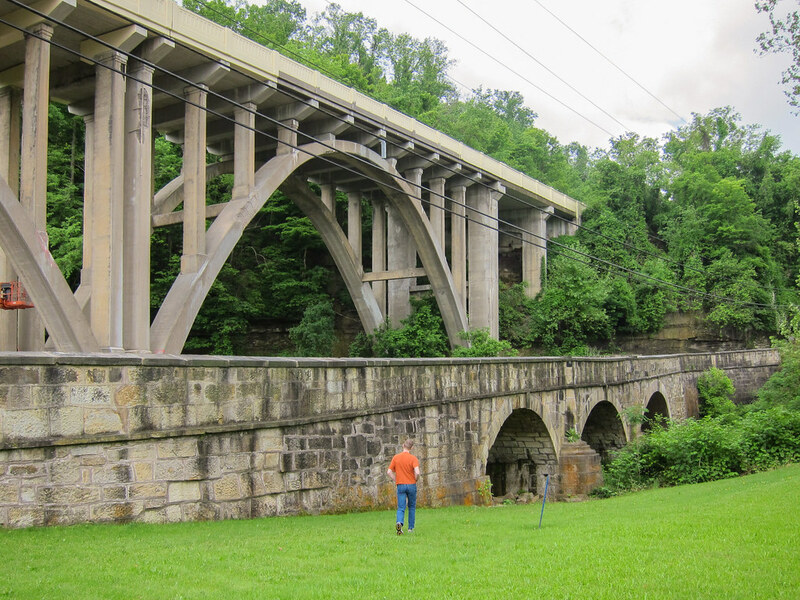 Crooked little bridges, well preserved — Two bypassed S bridges that have been restored. When someone tells me to hit the bricks, I take it literally — Several still-driveable sections of brick National Road laid in about 1917 remain in eastern Ohio. A quick tour of Zanesville — A well-preserved downtown, the famous Y bridge, and an unexpected sight. Concrete evidence — In 1914, 24 miles of experimental concrete were laid down on the National Road. Little bits of it remain. Improving the rutted road — Historic National Road photos from across Ohio. Stepping back in time for an overnight stay — 1950s-era motels still in operation in Columbus. Landmarks and historic architecture in Columbus — Seeing the sights along the National Road as it passes through town. The Main Street Bridge — There’s a new bridge over Main Street in Columbus. It’s a beauty. Serving the National Road traveler — Historic inns from the time when covered wagons were the road’s usual traffic. Seeing the sights in Springfield — I lingered in Springfield for a while because there was so much to see. Whatever happened to Tadmor? — It used to be a town on the National Road, at least until just after the flood of 1913. I stopped at McDonald’s on my last road trip — But not the McDonald’s you’re thinking about. A survey of all the old National Road and US 40 alignments in Indiana — Lots and lots of old pavement. The end of the Dayton Cutoff — Dayton, Ohio was bypassed by the National Road. Ticked locals built a successful competing road. It merged with the National Road just inside Indiana. Old McDonald’s sign on the National Road in Richmond, Indiana — Just like the title says! Richmond — One of the few Indiana towns along the road that was founded before the road came through. Classic motels on US 40 in Wayne County, Indiana — Several old motels still operate on the road near Richmond. Neon sign, lost — A neon sign for a store on the road in Richmond ended up in an antique store in Centerville. Arch city — Centerville is known for five arches that front its buildings along the road. The town has a colorful history, too. Suddenly, it’s 1860 — A return visit to Centerville, six years after the previous post. Indiana National Road milestones — Only two milestones remain on Indiana’s National Road. The Huddleston Farmhouse — A restored and lovingly cared-for 1841 inn and family residence that’s open for tours. Touring the Huddleston farmhouse, part 1: the exterior and grounds — I made a return visit to the Huddleston property and photographed the exterior more extensively. Touring the Huddleston farmhouse, part 2: the interior — Photos from inside the Huddleston farmhouse, which is set up much as it would have been when the Huddlestons lived here. The one old alignment of the National Road in eastern Indiana and the mystery of Star Blvd. — I had puzzled for years about the history of this old alignment between Dunreith and Raysville. Could Star Blvd. have once been US 40? I investigated. The McOuat building — A blighted building, restored. in downtown Indianapolis. The bridges that carried the National Road and US 40 over the White River in Indianapolis — A look at the 1916 bridge that is now part of a state park, and the bridges that came before it to carry the National Road here. Single frame: Washington at Addison — A photo of an Odd Fellows building on the National Road on Indianapolis’s Near Westside. The Central State Hospital for the Insane — Indiana’s first state insane asylum opened in 1848 on the National Road in what is now the Near Westside of Indianapolis. Its ruins remain. Philosophical questions along the National Road — How many times must a road’s path change before it’s no longer the same road? Straightened, widened, and moved — Realignments of the road as it leaves Indianapolis headed west. Nature always wins — A bridge and some concrete pavement abandoned since at least the early 1940s. Visiting my favorite abandoned bridge — A return to the bridge in the previous post, four years later. Iron’s Cemetery — An almost-forgotten cemetery, along the highway but hidden from view. Stilesville — Many tiny towns dot the National Road in western Indiana. This one, with a small “downtown,” is a giant among them. Grand old homes along Indiana’s National Road — If you keep your eyes open as you drive, you can take in some classic architecture along the road. A forgotten brick segment of US 40 — Bricks laid about 1923 are on private property today. Behind the Walker Motel — A 1923 concrete alignment of the road, plus a bridge, lay quietly behind an old motel. The Cooper Iron Bridge — A bridge that used to span Deer Creek on the National Road was moved around the corner when a newer bridge was built. Found: Hidden old National Road alignment — The alignment that led to the original site of the Cooper Iron Bridge is hidden in the woods. A kink in the Road — A gravel alignment and an abandoned bridge in Putnam County. Captured: Gravel National Road alignment — A brief second look at the Putnam County gravel alignment. The old road at Reelsville, part 1 — The original alignment of the road near this small town, plus a 1929 Luten bridge. The old road at Reelsville, part 2 — The 1923 realignment of the road near Reelsville. Puzzle solved: The National Road at Pleasant Gardens and Reelsville in Indiana — Other roadgeeks’ research laid out the timeline of the various National Road alignments here. The most dangerous highway in Indiana — Well, it was. In 1967. The opening of I-70 ended that. Return I will to old Brazil — A visit to Brazil, a small city built along the National Road. Several 1800s buildings still stand along the road. Captured: National Road gas station — A tiny brick house was once a gas station in Terre Haute. A visit to Rose-Hulman — My alma mater is on the National Road on the eastern edge of Terre Haute. I share some autumn campus photos. Roadside relics — Vigo County and Terre Haute are rich in 20th-century roadside sights. Where the National Road fades away — Modern US 40 and I-70 merge over the National Road’s original path near the Illinois border. The National Road in western Indiana — Provides a link to my full writeup of my August, 2009 trip. A brief history of the National Road in Illinois — Just what the title says. The National Road in Illinois — Twenty miles of abandoned brick highway. 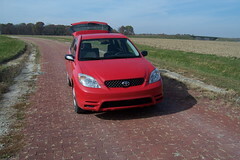 The abandoned brick National Road in Illinois — I had more to say about this old brick road. Road trip season is almost here — More photos of the abandoned brick highway. Building the Illinois National Road — Photos, ca 1925, of the brick road being built. Bursting the nostalgia bubble — Confronting a false fantasy while exploring the road. A famous row of buildings in Marshall, Illinois — A view of the same corner in 1950, 1980, and 2014. Captured: The Archer House — A photo of an 1841 inn on the National Road. The last stone-arch bridge still in use on the Illinois National Road — Just like the title says. It’s on the edge of Marshall. Neat creatures, 2 cents — A wooden cover over a modern concrete bridge near Clark Center makes for a good photo opportunity. The nine-foot-wide highway — A very narrow strip of concrete road east of Martinsville that is about 100 years old. The beautiful homes on Main Street in Casey, Illinois — Casey’s Main Street is filled with great old homes. It’s worth pulling off US 40 to follow the old National Road so you can see them. The Village of the Porches — Greenup’s downtown features striking New Orleans-style balconies on all the buildings. The covered bridge over the Embarras River — A modern wooden covered bridge carries the National Road over this river, and it’s a must-see. Are there two alignments of the National Road in Effingham, Illinois? — I vote yes. And I vote that the older alignment gets no props. Drunken road striping — The highway department clearly uses this old alignment for striping practice. A confluence of roads near Vandalia — A later alignment of US 40 and, later, I-70, left behind some old pavement east of Vandalia. The end of the National Road — Where the National Road ends in Vandalia, you’ll find evidence of Abraham Lincoln. The National Road revisited — Links to a long-form writeup of a late-2007 trip I made to explore the old alignments in Clark, Cumberland, and Effingham Counties. Captured: Senate chambers — The Senate chambers inside the former statehouse at Vandalia. I enjoyed your blog post, “The Dixie Highway in Western Indiana”. Do you know if there are any old alignments of Dixie Highway in Illinois? Unfortunately, I don’t. I’ve not traveled the Dixie in Illinois. Hello, Jim. Enjoying your blog on National Road articles. I just took a few shots of the abandoned bridge just west of Plainfield, IN, and will have a post on them later next week. Look forward to it Dennis! Glad you stopped by. Dear old Rose! Alan, Reelsville is one of my favorite places on the entire National Road because of all the old-alignment and old-bridge goodness happening there. I don’t know of Paul Pickett and his book, but will definitely look it up. Thanks for stopping by! Jim Thought i would also tell you about the 46 steel bridge over ell river at Bowling Green. Their going to build a new bridge, and they want to use the old bridge in Brown co. Indiana. Locals here want it to stay alongside of new bridge, and are trying to save it. I know the bridge. It’s a favorite. As long as it’s saved somehow I’ll be happy. Being Canadian, I had never heard of the National Road before I stumbled across your blogs. I must say I’m now hooked on the old road! Now there are two roads I have to drive someday: Route 66 and the National Road! Thanks! I was wondering how much time I should allow for the drive. I was thinking about starting in Baltimore and heading west from there. I want to take my time and see all the historic bridges, buildings, old alignments, etc. PS. Eastern Ohio’s portion of the NR is -outstanding-. 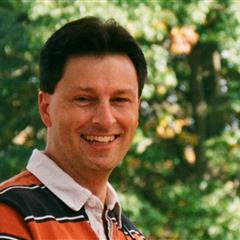 I hope that on my next drive down Maryland’s National Road that I can visit your museum! I like your highlights of various roads along the way and the interesting finds.